David Burnham and the students in "Performing with the Pros"
For California School of the Arts-San Gabriel Valley’s (CSArts-SGV)’s first “Performing with the Pros” event, students in grades seven to 11 from the Musical Theatre, Acting, and Integrated Arts Conservatories had the opportunity to collaborate and perform with Broadway actor and singer, David Burnham. For roughly four weeks, students worked side-by-side with the artist-in-residence, learning songs from Burnham’s career, such as songs featured in “Wicked to Joseph and the Amazing Technicolor Dreamcoat.” During their time working with an experienced artist in the field, students had the chance to learn and experience what it would be like to be a professional in the field. Students have the opportunity to perform with Burnham individually or in small groups. “It is our hope that students involved in Performing with the Pros experience not only the discipline and thrill of performance and the preparation necessary for it, but to engage our guest artists on a more personal level. Our students are afforded the opportunity to ask individual questions and learn specific traits that have contributed to our guest artist’s success and stability in the craft,”Associate Director of the Arts Stephen Cook said. David Burnham works with a student for “Performing with the Pros” during rehearsal. During the time students worked with Burnham, they had the opportunity to connect with the artist and push their limits. Rehearsals were filled with energy as students pushed their boundaries and discovered better ways to be storytellers and artists. David Burnham working with a student during rehearsal. 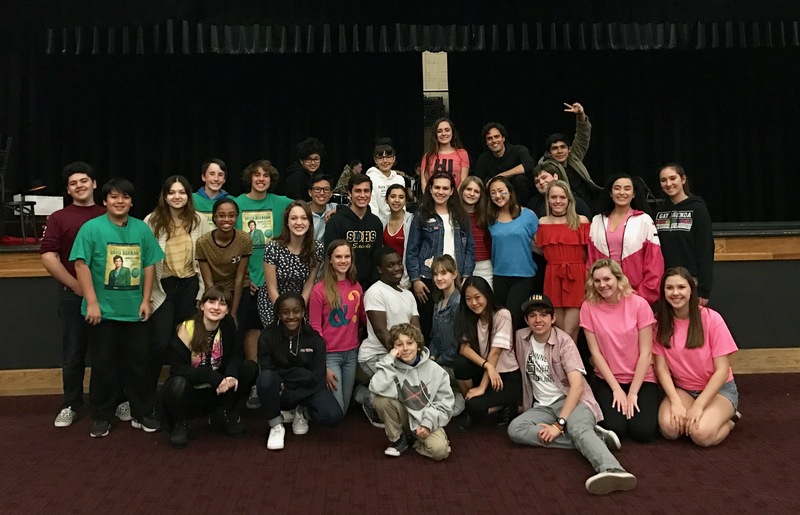 While Burnham might be rediscovering his passion for theater, students are just discovering their potential to grow in the field. “The rehearsal process has given me a taste of what to expect in a future of studying musical theatre in college, having rehearsals every day after academic and art classes. My favorite part has been being able to sing roles that I’ve always wanted to sing onstage. I have always listened to and loved these songs, but I’ll need to wait a few years until I’m able to be in the shows. The songs I sing with my peers and with David are from musicals that I hope to perform in one day as an adult, and performing them with a professional really give me an idea of what that will be like,” junior Catherine ‘Rinn’ Maldonado said. Even though the show features David Burnham, it is still largely centered on students. Rather than only performing with Burnham as ensemble or accompaniment, the students have the chance to perform pieces individually or in small groups with Burnham. David Burnham sings “Suddenly Seymour” from Little Shop of Horrors with students at rehearsal. The only show of “Performing with the Pros” with David Burnham takes place this Saturday, March 31 at 7:00 pm at the Bonita Center for the Arts, 822 W Covina Blvd, San Dimas, CA 91773. Tickets can be found at siteline.vendini.co. Don’t miss out on the one chance to see the unique and cohesive collaboration between a professional performer and our aspiring artists!